In the anime, she has light blonde hair tied in a loose ponytail with occasional strands sticking out. Her eyes are obscured with her swirl-tinted glasses. She wears a white laboratory coat over her red dress and puts on her Forehead Protector backwards, as a sash around her waist. Shiho is an upbeat, cheerful girl who appears to be attracted to Shikamaru Nara. When Shikamaru told her he would return to the Cryptology office when he learned anything new, Shiho refused an offer to go home from her boss. Instead, she fixed herself up in a mirror, intending to see Shikamaru again when he returned. 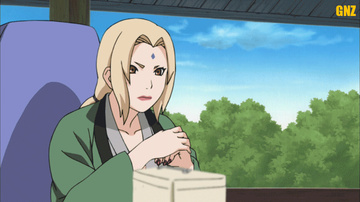 Shiho also blushed when Shikamaru accepted her offer of accompanying him back to Tsunade's office. The side text on chapter 407's cover page, which Shiho appeared on, mentioned how excited and nervous she gets around Shikamaru.